Happy Swiss Day, everyone!!! Just to give some perspective, the 1er août (said premiere-oot) is like the equivalent of the 4th of July for Switzerland. They decorate everything all over the city, and of course, everything shuts down in true Swiss holiday tradition. They even changed the trash bags out in honor of la fête! We wanted to get the hard-boiled eggs featured below to celebrate in style, but forgot to get them 3 days in advance before all the stores closed for normal Sunday and Holiday Monday. In 1291, in early August, there was no Switzerland. There were constant attacks of other countries wanting to conquer the areas which now are Switzerland. Three independent republics made a pact saying they’d protect each other, which formed the groundwork for the later development of the Confederation Helvetica, or CH. Still today, all the cantons operate independently, with their own police, transportation, taxation and school systems. There are four different languages spoken in Switzerland, and the canton official language depends on your geography. This system allows different geographic regions to still exercise their historical preferences, but still be a part of the overall country of Switzerland. Based on this date back in 1291, they have a fête on the 1st of August every year to celebrate this confederation of Switzerland. We checked out the festival this evening in our city, Geneva, which has quite a big to-do. However, this type of festival takes place all over Geneva in all the little towns and villages. They say you can go out to the mountainside and it is quite a sight to see the bonfires in the distance. S taught me that the bonfires symbolize the communication the towns had with each other as that was their only method back in the day. 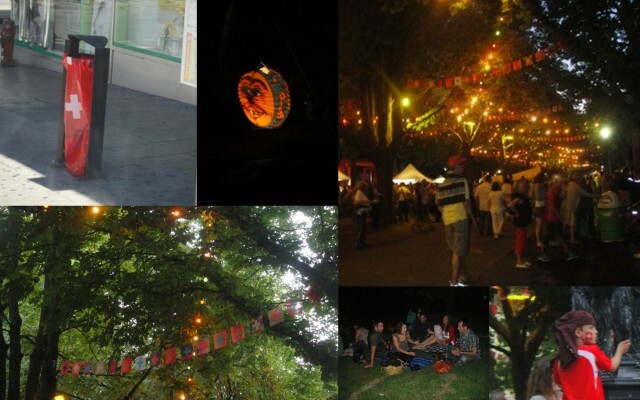 Therefore, bonfires and lanterns are some of the characteristics of the 1er août fête. Check out some of the scenes from the fête as well as a video of the huge bonfire in the park! This entry was posted in Festivals & Events, Holidays & Traditions, Life in Geneva, Summer, Swiss History & Politics, Uncategorized. Bookmark the permalink. What a great opportunity – to enjoy your experiences, learn a history lesson – while waiting in a Toyota service lounge in NJ! I feel like I’m traveling without leaving my chair. Thanks!! !